With well over two million of his books sold, and huge praise from many media outlets, Dr. Thomas J. Stanley is a recognized and highly respected authority on how the wealthy act and think. Now, in Stop Acting Rich ? and Start Living Like a Millionaire, he details how the less affluent have fallen into the elite luxury brand trap that keeps them from acquiring wealth and details how to get out of it by emulating the working rich as opposed to the super elite. A defensive strategy for tough times, Stop Acting Rich shows readers how to live a rich, happy life through accumulating more wealth and using it to achieve the type of financial freedom that will create true happiness and fulfillment. 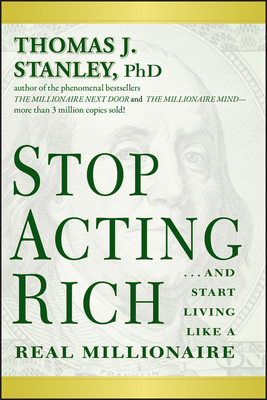 Thomas J. Stanley is the bestselling author of The Millionaire Mind and The Millionaire Next Door, which have sold more than 3 million copies worldwide. A recognized authority on the lifestyles and behaviors of the affluent, Dr. Stanley is frequently quoted in the Wall Street Journal, New York Times, Forbes, and other major publications. He has appeared numerous times on the Today show, 20/20, and Oprah. Visit Dr. Stanley at www.thomasjstanley.com.